The manner and the standard of justice and fairness, which Allah the Exalted has instructed Muslims to establish is such that it is not found in any other scripture. However, it is unfortunate that currently there is a large section of Muslims from all spheres – from among the (political) leaders as well as the clerics – who do not fulfil the requirements of fairness and justice. Likewise, those standards of fairness and justice, which were established by Allah the Exalted and are expected from a believer, are usually not observed in the domestic sphere among the general population of the Muslims in their regular dealings. Injustices are practiced at a family level. Then, the rulers do not fulfil the requirements of justice at the national level. The requirements of justice are neither fulfilled in respect of the public, nor with regards to international dealings. The first verse I recited gives clear unambiguous guidelines. Thus, this is the command of establishing the standard of justice in personal and domestic matters as well as social matters, no matter what is at stake and with the sole intention of seeking the pleasure of God Almighty. However, this can only be achieved when a person has absolute faith in God Almighty and when his belief is of the highest standard and very strong. One should firmly be established on the fact that regardless of the circumstances that might befall me, I will always remain firmly established on justice. However, this firm resolve can only be achieved and manifested when a person is willing to testify against himself, against his wife and children and, if need be, to testify even against his parents and close relatives. Nowadays, many social issues are a result of the fact that the standard of justice and equity is not as Allah the Exalted desires. It is very common to twist one’s own statements. It is unfortunate that at times, even among us there are some, having been influenced by materialism and our surroundings, despite having pledged initiation to the Promised Messiah (as), make statements and give testimonies, which are not based on facts and realities. God Almighty states that whether you personally suffer a loss or whether your parents do so, never make a deceptive statement or one, which gives the impression that you have concealed the truth and tried to save yourself from giving an honest testimony. God Almighty says that you should not conceal the truth whether it is against yourself, your parents or your close blood relatives; you must always express the truth. Also, you should always remember that God Almighty says that He is well aware of whatever you do. God Almighty cannot be deceived. God Almighty says that you may gain worldly benefits, however, even if you have evaded the punishment of God Almighty in this world, you will be punished in the next world. The Imam whom we have accepted, has established such examples, whilst following this Qur’anic injunction, that even the non-Ahmadis are left astounded. On one occasion, his truthful testimony in the court led to some financial loss to his father. His lawyer had even told him beforehand that if you do not give a testimony in accordance to what I say, you will suffer a loss. However, the Promised Messiah (as) said that whatever the circumstances might be, I will most certainly speak the truth. Thus, this is the example of the true servant of the Holy Prophet (sa), whom we have accepted. Furthermore, we must keep this example in mind and assess every matter relating to our testimonies in light of this example. Those, tempted to evade the tax or claim benefits unfairly must keep the example of their holy master in their minds, , Ahmadis must bear worldly losses and not hide the truth. They must always speak the truth. If their intentions are pure, if they firmly hold on to justice whilst being witnesses for God Almighty and if they elevate and establish the standard of their testimonies to the standard of Qaul-e-Sadeed(speaking clear and transparent truth) then God Almighty, Who is the Lord and Provider, will personally make provisions and also bless those provisions. Thus, we must always continue to assess and evaluate ourselves. Allah the Exalted has been gracious to us by enabling us to accept the Imam of the time. Allah the Exalted has made arrangements for us to be brothers to one another. However, for the sake of some of our personal gains, or for the satisfaction of our egos, or due to holding grudges for others in our hearts we try to take revenge and in doing so we go to such an extent, which even removes the fear of God the Exalted from our hearts. In some places there are religious differences and as a result, people of other faiths commit transgressions, but in such circumstances, it does not behove a believer to take revenge and fail to uphold the requirements of justice. Regarding this Hadrat Khalifatul Masih I (ra) once stated in his address that for example, in this time the Aryas would harass the Muslims in their jobs, get rid of them but even if they did do this then it is not the right of a Muslim to take revenge from them. By doing so, it is only then can we act in accordance with this command. The work of a believer is to establish justice, to act with righteousness and to leave his affair with God Almighty, Who is All-Aware. The real meaning of bearing witness in equity is to act in strict accordance with the Islamic teachings that it becomes an example for the people of other faiths, for society at large and for other nations too. This is why God Almighty stated that the enmity of a nation should not entice you to cross the limits to the extent that you fail to uphold the requirements of justice. You must by all means maintain justice. It should have been the case that the Muslims tell the world of the beautiful teachings of Islam and convey the message of Islam by displaying their example. But the exact opposite is the reality, and nothing is observed in Muslim countries except for atrocities. The beautiful teachings of Islam can only be manifested when there is support of the truthfulness of Islam or the support of the truthfulness of God Almighty. How beautiful indeed is the command of the Holy Quran ‘and let not a people’s enmity incite you to act otherwise than with justice‘. This command has not been given in any other religious scripture. There should be no discrimination in acting justly and Muslims and non-Muslims alike are equally entitled to attaining justice. I shall give a few examples of the minute details through which the Holy Prophet (sa) caused the companions to act upon this. Once the Holy Prophet (sa) sent some of his companions to Mecca to get information. The circumstances of the Muslims at that time were extremely perilous where the enemies were always attacking them and trying to cause them harm. In these circumstances, when the companions went there to get information, they met some enemies in the vicinity of the sacred mosque. The Muslims thought that since they had spotted them and if they let them go they will go back and inform all the Meccans, who would attack and kill us. With this in mind they attacked those disbelievers and killed maybe one or two of them. When these companions returned to Medina some of the Meccans also came to say how your people have killed two of ours within the holy vicinity and left. The Holy Prophet (sa) listened to what they said but in his reply didn’t say that you yourselves have been transgressing therefore why are you are you making a big deal of this now just because you also have been treated in the same way? Instead he immediately took action and the answer he gave them was that you have been wronged and treated unjustly. Perhaps the disbelievers didn’t attempt to fully protect themselves as they were within the holy vicinity, so for this reason the Holy Prophet (sa), in accordance with the Arab tradition, ordered for the blood money of the two killed to be paid right away. He paid this off and reprimanded the companions for the wrong they had committed. Similarly, there is another incident where during a battle a woman was killed at the hands of a companion. The Holy Prophet (sa) came to know of this he was infuriated with that companion and the signs of his anger on his face were so manifest that was never witnessed before. The companion who had killed that woman did say that she was killed accidentally, the Holy Prophet (sa) was still very grief-stricken that justice had not been maintained. It is narrated that a companion owed a Jew four Dirhams which he had taken on loan and the fixed period for its repayment had already passed. The Jew approached the Holy Prophet (sa) and complained that this man is not returning my four Dirhams. The Holy Prophet (sa) summoned that companion, Abdullah (ra), and told him to give back what is due to this Jew. Hadrat Abdullah (ra) said that I swear by the One Who has sent you with the truth, I am not able to pay back my loan. I understand that I must pay it back but at this moment I cannot. The Holy Prophet (sa) again told him to return the money but again Hadrat Abdullah’s (ra) reply was the same and said that you will send us to Khaibar and I will pay back the loan out of the spoils of war when I return. But again, the Holy Prophet (sa) told him to pay back what is due to him. Whenever the Holy Prophet (sa) repeated a thing three times then it was understood to be a final decision. Hence, Hadrat Abdullah (ra) went straight to the bazaar. He had a cloth wrapped around his waist and one on his head. He took off the cloth on his head and tied it around his waist, sold the other for four Dirhams and paid off the loan. So, this is the standard which the Holy Prophet (sa) established. He didn’t tell the Jew to grant him respite when he asked for it. Instead he told his companion to pay back the loan immediately even if it means selling the clothes he was wearing. So, these are the standards of justice and fairness which we must maintain on all levels if we are to be among the real followers of the true servant of the Holy Prophet (sa) in this era, and to fulfil the purpose of the Promised Messiah’s (as) advent. In the verse of Surah A’araf which I recited, God Almighty has commanded us to this very point. The translation of this verse is ‘And of those We have created there are a people that guide men with truth and do justice therewith‘ (Al-A`raf 182) The ones giving guidance have always been the ones who speak of justice and equality then give guidance. How can one grant justice to others, if he himself is not established on justice? Therefore, if we want to fulfil our pledge with the Promised Messiah (as), complete his mission, spread the message of Islam to all parts of the world and to fulfil the due rights of Tabligh(propagating the message) then we must adopt all of the excellent morals in accordance to this principal which is the teaching of Islam and the instruction of the Holy Prophet (sa) and which the Promised Messiah (as) has also told us to adopt. 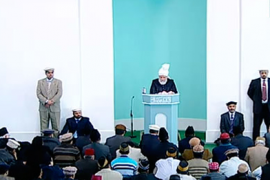 If our testimonies are not based on truth and justice, if our conduct within the home and in society is not according to the instructions of the Holy Prophet (sa), if our hearts are not pure from rancour and malice for our enemies, then our Tabligh will not be one that propagates true guidance. Thus, every Ahmadi has a great responsibility wherein they have to open the avenues of Tablighthrough their own conduct and practise. May God Almighty enable us to lead our lives by adhering to His commandments and fulfil the due rights of the pledge we have made with the Promised Messiah (as). We must fulfil the pledge we have made with the Promised Messiah (as) and become a model for others in respect to true guidance and justice. After the prayers I will lead the funeral prayer in absentia of Mr Hasan Muhammad Khan Arif Sahib, who was the son of Mr Fazal Muhammad Khan Sahib Shimalvi. Mr Hasan Muhammad Khan Arif Sahib was the former Vakeel-e-Tabshir, Rabwah and was also the editor of the Ahmadiyya Gazette, Canada. He passed away on 3rd November 2017 at the age of ninety-seven. To Allah we belong and to Him shall we return. By the grace of Allah he was a Moosi (part of the institution of Al-Wasiyyat). Mr Hasan Muhammad Khan Arif Sahib was born in Jalandhar, on 26th January 1920. In 1915, his father, Fazal Muhammad Khan Sahib Shimalvi had the opportunity to perform Bai’at at the blessed hand of Hazrat Khalifatul Masih II (ra). In 1943, during Hazrat Musleh Maud (ra)’s visit to Delhi, despite serving in an office for the Indian Government, Hasan Muhammad Khan Arif Sahib decided to devote his life (for the services of Ahmadiyyat). When he told this news to his father, he was delighted, but at the same time he advised him by saying: “You are about to devote your life, do not think that it will be a life of ease. If you wish to be a devotee of life in the true sense of the word, then remember that it is a bed of thorns. In this path you will not receive royalties or luxuries, and will have to live like common folk. Your allowance as compared to your current salary will be negligible, but you will have to manage within that amount.”I am also acquainted with him since my childhood, yet after Khilafat, his attitude changed completely to an astonishing degree. In the beginning when there were no computers, he would prepare the Urdu section of the Ahmadiyya Gazette by hand and would get the English section typed up. He would also translate the Sermons into English and would check over them repeatedly until he was satisfied, and only then would he include it in the Gazette. He had an exceptional memory and extensive knowledge about the History of Islam. He would always read a book or magazine. He would read the newspaper regularly and also narrate faith inspiring incidents from the lives of the Companions. May Allah shower His mercy and forgiveness on the deceased and elevate his status. May He enable his children and progeny to remain firmly attached with Khilafat and Ahmadiyyat.